If you don't care about retaining all the history of one of the repositories, you can just create a new directory under one project's repository, then import the other. If you care about retaining the history of both, then you can use 'svnadmin dump' to dump one repository, and 'svnadmin load' to load it into the other repository. The revision numbers will be off, but you'll still have the history. The above quote is from the Subversion FAQ at Tigris.org. After reading it, one might get the impression that merging two SVN repositories is a trivial process. Of course that largely depends on your situation, but it is usually not as streamlined as the above quoted text implies. In this post I will try to detail how I was able to achieve that. Due to certain circumstances we had to temporarily stop using the public Ra-Ajax SVN repository at Google Code and continue the development of Ra-Ajax using a private repository at our server. Now that these circumstances are gone, we wanted to merge all revisions from the repository at our server back to the Google Code repository so that we don’t lose any history of changes and can resume development using the Google Code repository. It would be convenient after installing VisualSVN Server to add its bin folder to the PATH environment variable; since we will be using several of the utilities there from the command line. Since we wanted to retain all history of both repositories, following the advice of the Subversion FAQ was the initial plan. However, using ‘svnadmin dump’ and ‘svnadmin load’ means that you must have access to the servers that host both repositories. The reason for this is that the two commands expect a path to the repository and not a URL. This is of course possible with the repository that we want to dump which is the private repository at our server but it can’t be done, as far as I know, with the other repository at Google Code which we want to load the dumped repository into. To overcome this problem we can mirror the Google Code repository locally and work on this mirror instead. Then we can reset the Google Code repository to revision zero and sync it to this mirror, which would finally contain the result of merging the two repositories. If this seems a little vague to you now, continue reading and more details will come. This will filter out the unneeded projects from PrivateRepo.dump and save the result to the Ra.dump file which should only include the project ‘Ra’. The optional arguments --drop-empty-revs and --renumber-revs are necessary here to remove any empty revisions resulting from filtering and to appropriately renumber the revisions that are left. The solution I used to solve this problem is to mirror or synchronize project ‘Ra’ to its own dedicated local repository on my machine. Then dump that mirror instead. 2. Right-click Repositories and create a new repository. We will call it ‘RaMirror’. 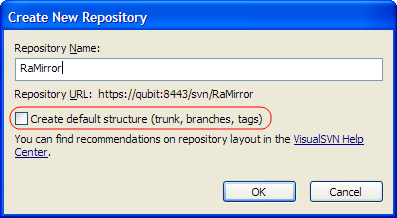 It is important here to keep ‘Create default structure (trunk, branches, tags)’ unchecked since we want this repository to remain at revision zero in order to be able to sync it. 3. Right-click the repository ‘RaMirror’ and click on Properties. Here you should make sure that the user we have created in step one has read and write access to this repository. 4. Before we can sync the two repositories ‘Ra’ and ‘RaMirror’ we need to edit the hook scripts for ‘RaMirror’. If you installed VisualSVN Server accepting all defaults, the folder that contains the repository files for ‘RaMirror’ will usually be ‘C:\Repositories\RaMirror’. Under the hooks folder, you will find the default hook scripts. These are Unix shell scripts, you can of course modify them to work on Windows if you want. But in our situation we don’t really need to do that. We can just rename all hook files to use the ‘cmd’ or ‘bat’ file extensions instead of the default ‘tmpl’ extension in order to make them executable on Windows. Here we are using svnsync with the init subcommand. We are providing credentials using --source-username, --source-password for the source repository that we want to mirror, and --sync-username, --sync-password for the destination repository which is ‘RaMirror’. Then we provide the URL of the destination repository and the URL of the source repository respectively. Note that we also pass the --incremental option so that the first dumped revision, 2 in our case, would only describe the changes in that revision and not everything that existed in the repository as of that version. I also similarly mirrored the repository at Google Code to a local SVN repository and named it ‘RaGMirror’. Since the name of the repository we mirrored is ‘Ra’, the Ra.dump file will have the file/folder names that reside in the root of the repository prefixed with a ‘Ra’ folder. And since we need these files to be created at the root of the repository when we load this dump file not under a subfolder, we need to do some editing. You can read more about this here. After the loading process is finished successfully, the ‘RaGMirror’ repository would contain all revisions and full history of the two repositories that we wanted to merge. The final step now is to sync this local repository ‘RaGMirror’ back to the public Google Code repository. Akin to what we did in step five in the previous section, but of course changing credentials and the source and destination URLs. However, before this can be done, the repository at Google Code must be reset to revision 0. Be careful as many things can go wrong, be sure to have backups of every repository you are about to change and use the information provided here at your own risk. The image below shows the two revisions where both repositories merged seamlessly. You can use All Tasks -> Manage Hooks command to setup Subversion hooks instead of editing files in tmpl directory directly. Glad you liked it Ivan and thanks for the tip! Thanks for the blog. 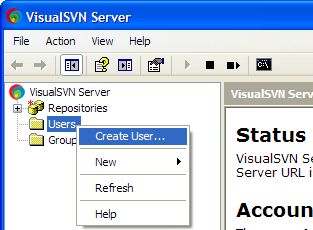 I want to sync up two visual svn repositories but while executing svnsync init as per you suggested in your blog it also ask for windows NT authentication. Can you tell me how can I override this. I have not seen this step in any of the tutorial. Any help will be appreciated. You are welcome Mohammed. Are you writing the destination repository in this format file:///path/to/repository? Are you logged in to the same machine that hosts that repository? Repeating this step for each dump file and loading it under its own subdirectory under trunk will hopefully give you the result you want. However, if you just want to backup the four repositories and don't necessarily need to access them from the new repository it would be enough to just create the dump files and keep them as backups. Praveen, you should be specifying the root for both your source and destination repositories when you sync. While migrating the data of a particular folder from one repository to other folder in other repository, i am missing certain log records. If you check the actual log on the source folder it shows more records than the log record shown in the mirrored one. In turn the number of available revisions is also less than required. I have followed each step of this tutorial. Is it something to do with editing dump file? Please guide over all this. Hi Aaditya, after executing svndumpfilter as it is above, the unneeded revisions will be dropped and the remaining revisions will be renumbered. Make sure to examine the resulting dump file after executing svndumpfilter to verify that it includes the required changes.